OTTAWA - The splashy home pages for the Harper government's elaborate War of 1812 website were by far the most popular feature for visitors who crowded into the online museum last year, thanks to an ad blitz during the Olympics. The next most popular page? The exit. The government spent upwards of $28 million to commemorate the 200th anniversary of the War of 1812, billing it as an under-appreciated piece of Canadian history. Indeed, polls conducted in the years prior to the anniversary suggested most Canadians had little knowledge or interest in the conflict that some argue lay the groundwork for Confederation. An ad campaign that included $1.45 million for a spot during the Summer Games was part of the federal government's effort to educate, along with an in-depth website. Statistics gathered by Canadian Heritage and released under the Access to Information Act showed an average of 6,052 visits a day to the site between July 27 and Aug. 12 last year, during the Olympics. A week before the Games, the average was only 1,741 visits. The site registered 2,463 visits the week after the Games. A deeper look at which pages were visited the most during a slightly broader period revealed — perhaps not surprisingly — the site's English and French home pages as the most popular. The English home page registered 83,458 visits between July 22 and Aug. 19, compared with 22,897 at the French home page. The page letting people know they were leaving the site was next on the list, registering 17,693 visits between July 22 and Aug. 19, the statistics show. That's the page that appears when visitors click on links to websites not run by the government, such as social media sites or the iTunes store, where a War of 1812 mobile app was available for download. 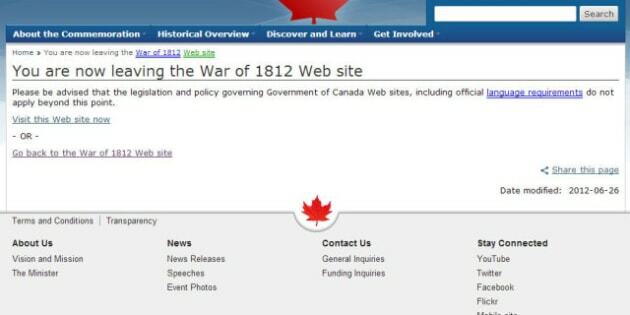 All of the related links provided on the government's website were for other 1812-related websites. "1812.gc.ca proved to be a key referrer for Historica-Dominion's eighteentwelve.ca website," the analysis said. It was the fifth most often-visited page. The other most popular elements of the government site were an overview of the history of the war and a video gallery. Among the videos was an ad called "The Fight For Canada," styled as a movie trailer featuring some of the key figures in the conflict between the United States and Britain. A regular fixture of Olympic coverage, the ad — which was also posted on YouTube —ended by directing viewers to the web address. The analysis noted links posted on Facebook and Twitter were a key driver of English traffic to YouTube. "Twitter seems to have a very low impact on the French side visits to YouTube," the analysis said. Meanwhile, English visits to YouTube didn't appear driven by the government's ad, French visits doubled, the analysis said. How people responded to the ad also depended on where they were from. "A much larger proportion of Americans than English Canadians didn't like the ad," the analysis said. "Only 17 per cent of English Canadians didn't like the video compared to 30 per cent of Americans." U.S. visits to the government's website amounted to about 16 per cent of clicks. Most of the visits came from Ontario, followed by Quebec. Of the dozens of pages on the site which highlighted "heroes" of the war, the most popular was the one belonging to Laura Secord.